Hong Kong is a Special Administrative Region of China, with a population of 7.3 million. Despite of the crowded living condition, it now enjoys a very low mortality rate and the highest life expectancy rate in the world. This success is tribute to a high-quality health-care system, including the maternity services. In Hong Kong, the Midwives Council of Hong Kong (the Council) is the regulatory body of the midwifery profession. The Council carries out the statutory duties assigned to it by the Midwives Registration Ordinance (Cap 162, Laws of Hong Kong) which include the registration of midwives and the discipline and regulation of the profession. It also sets up standards and requirements for training institute to develop the midwifery training programmes. Currently, the only midwifery training programme approved by the Council is an 18-month Post-registration Diploma in Midwifery conducted by the School of Midwifery in Prince of Wales Hospital. 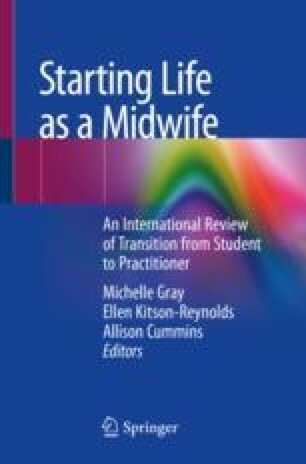 This chapter consists of a brief outline of education and regulation leading to initial and ongoing registration, the transition of new midwives after registration and a reflective experience written by a new midwife. The Hong Kong Year Book. 2016. https://www.yearbook.gov.hk/2016/en/index.html. Accessed 12 Jan 2018. The Midwives Council of Hong Kong. Handbook for midwives; 2014. http://www.mwchk.org.hk/english/conduct_n_practice_midwifery/handbook_for_midwives.html. Accessed 2 Dec 2017. The Midwives Council of Hong Kong. 2017. http://www.mwchk.org.hk/e_index.html. Accessed 2 Dec 2017. The Midwives Council of Hong Kong. A reference guide to the syllabus of subjects & requirements of midwifery training program for registered nurse; 2017a. http://www.mwchk.org.hk/english/training/syllabus.html. Accessed 2 Dec 2017. The Midwives Council of Hong Kong. Handbook for accreditation of midwives’ education programs/training institutes for midwives registration; 2017b. http://www.mwchk.org.hk/english/training/handbook_for_institutes.html. Accessed 2 Dec 2017. The Midwives Council of Hong Kong. Handbook for accreditation of clinical training sites for midwives registration; 2017c. http://www.mwchk.org.hk/english/training/handbook_for_clinical.html. Accessed 2 Dec 2017. The Midwives Council of Hong Kong. Standards for midwifery education; 2017d. http://www.mwchk.org.hk/english/training/standards.html. Accessed 2 Dec 2017. The Midwives Registration Ordinance, Cap. 162, Laws of Hong Kong; 2012. http://www.mwchk.org.hk/english/ordinance/index.html. Accessed 2 Dec 2017.